Thank you to James O'Donnell of the Smithsonian for the above photo. Okay, old news. It opened well over a month ago—seven weeks ago—on March 6. I had also planned to post about the opening reception, but that was March 20 so—old news there as well. In any case, the reception was lovely, with Asian food served and tinkling glassware and everyone dressed quite nicely. Also, my colleague and friend Maria Felenyuk, who designed the graphics for the museum’s new Stamp Gallery, was back in town from traveling the globe and joined us [she’s available—you should hire her! ]—so it was great! Exhibit openings are the best! 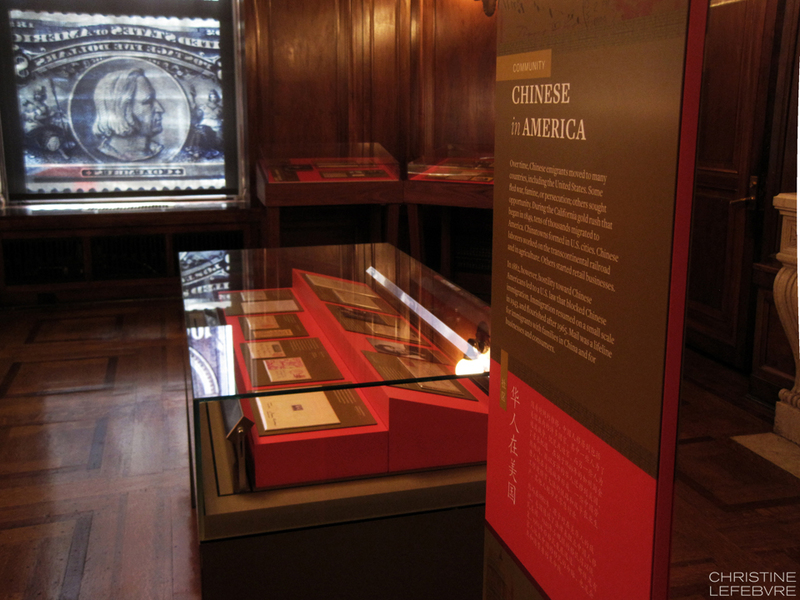 Pacific Exchange: China & U.S. Mail is the second exhibit to be on view in the Postmasters Suite gallery at the Smithsonian National Postal Museum. 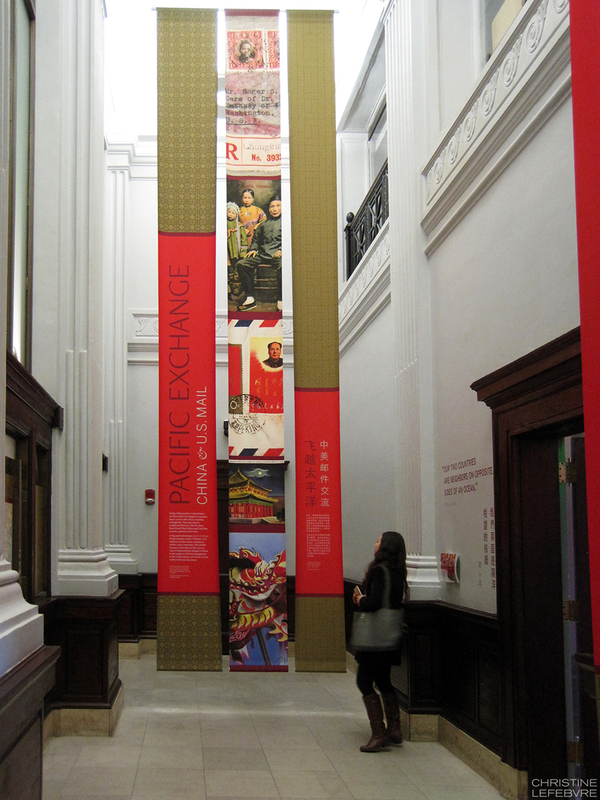 From the exhibit website: Using mail and stamps, Pacific Exchange brings a human scale to Chinese-U.S. relations in three areas: commerce, culture, and community. The exhibit focuses on the 1860s to the 1970s, a time of extraordinary change in China. It also explores Chinese immigration to the United States, now home to four million Chinese Americans. I handled all of the design myself, from designing the exhibit “look” to laying out production files for all of the graphics. 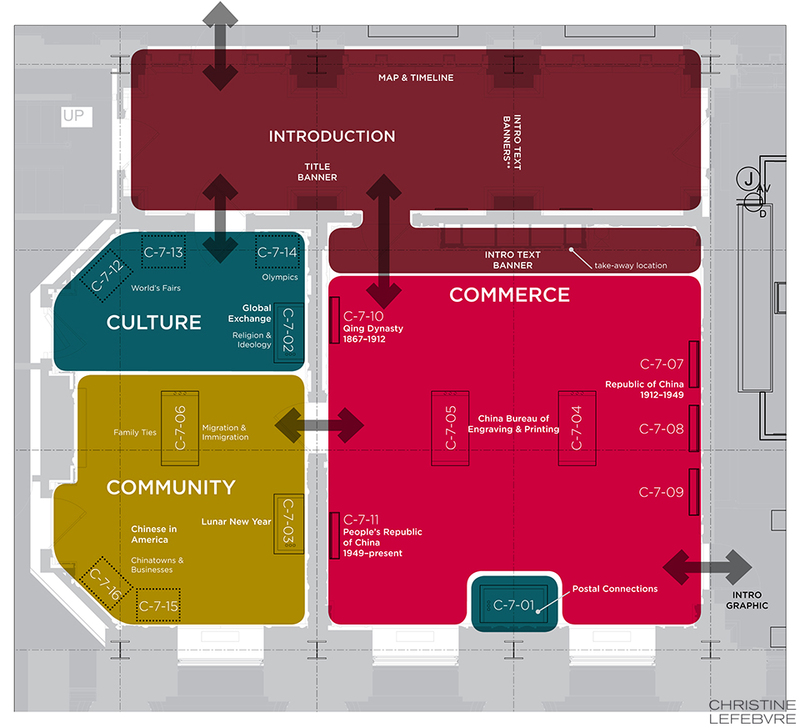 I also created the exhibit plan and did the artifact case layouts. Even though this is a small exhibit space, it had more than 100 artifacts, so making [nearly] everything fit comfortably was a bit of a challenge! Most of the exhibit text is in English and Chinese, a design challenge I enjoyed. In the artifact case below, some of the artifacts were loans that I had to display flat; hence the stepped design of the case furniture. The other half was at 15° to create a comfortable reading angle. 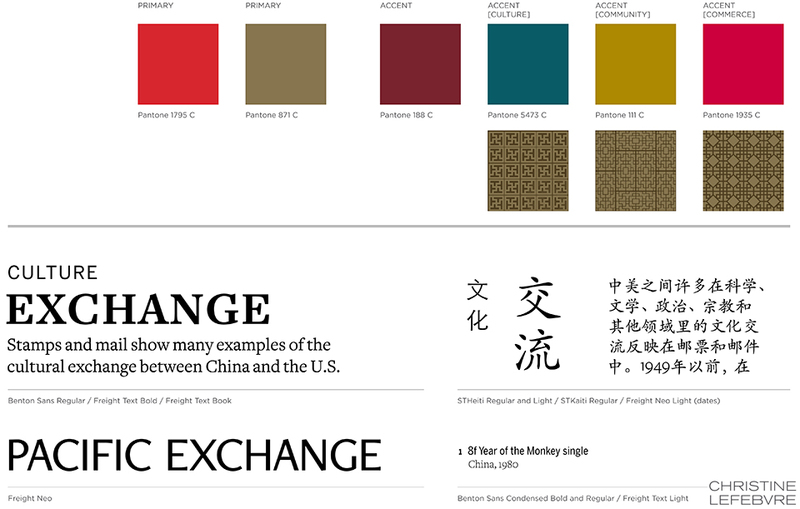 I arrived at the color palette after some research into culturally significant colors in Chinese culture. I used red and gold—a quintessential Chinese color combination—as the dominant exhibit colors, with a deeper maroon red for accent. 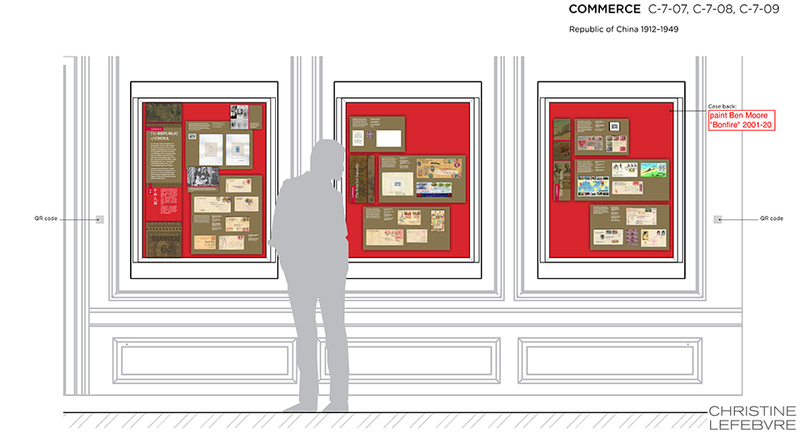 I used a third red, one with pink undertones, (red, the color of prosperity and good fortune, among other meanings) for the Commerce section of the exhibit; yellow, the color of heroism, for the Community section; and blue-green, or “qing” to give a feeling of Chinese history and tradition, for the Culture section. (My descriptions of the color symbolism are very simplified.) I also drew distinctive vector patterns for each section. Graphics were digital output mounted on sign blank, trimmed to edges, with a matte overlaminate. 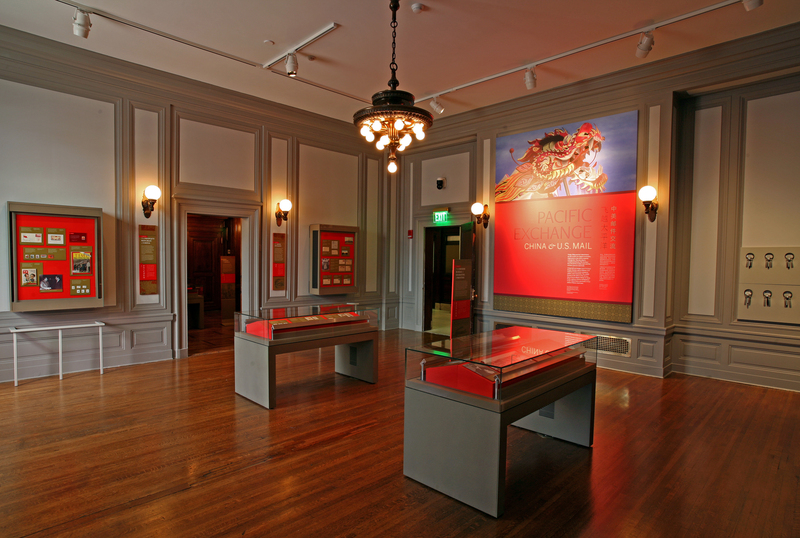 The wall-mounted and freestanding graphics were backed with 1/2″ MDF painted Benjamin Moore “Bonfire” to match the primary exhibit red (Pantone 1795). 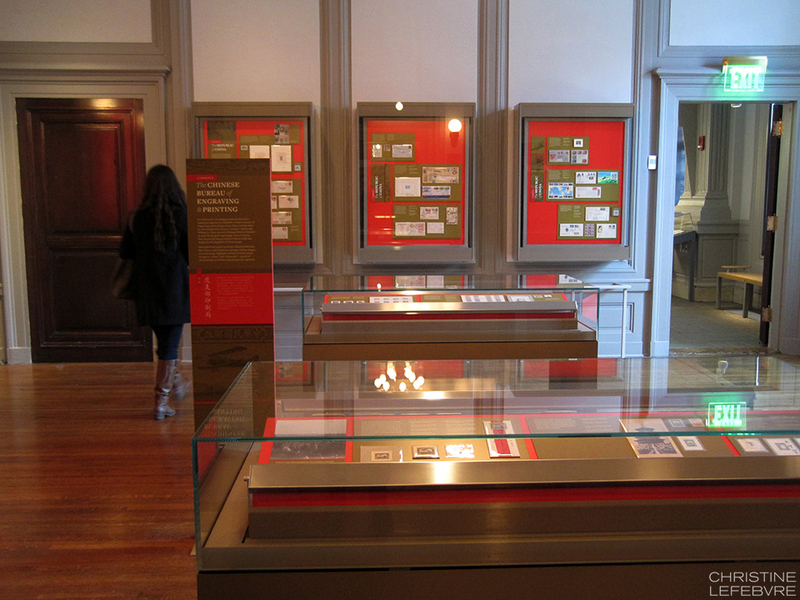 The freestanding graphics had duplicate panels on either side of the mdf—a panel sandwich which was held in place by adjustable metal sign bases. 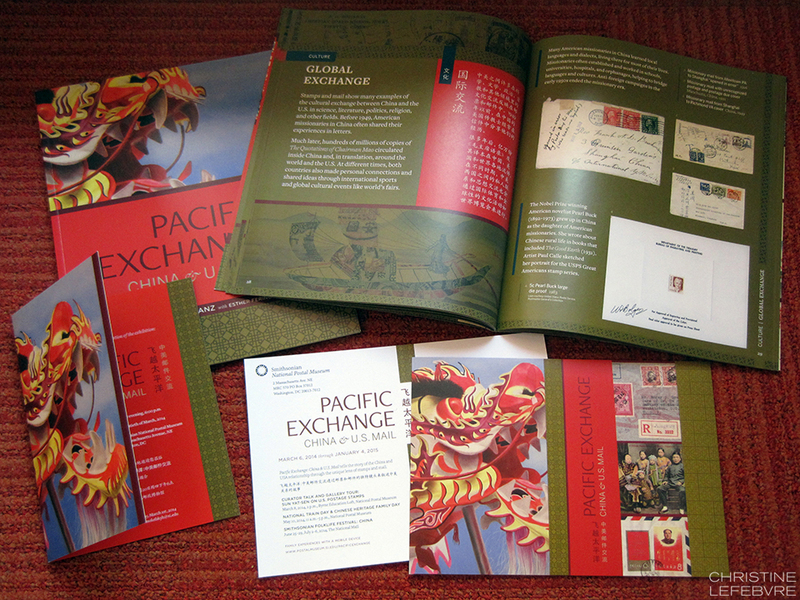 The Smithsonian Office of Exhibits Central printed and built the graphic components. Blair Fabrication built the case furniture. The element that most people rave about is the group of banners in the entrance. There are four individual banners and they’re more than 20 feet tall! EPI Colorspace printed and installed them. (Install pictures here.) They were printed on “Brilliant Banner” 12 mil. polyester banner fabric. The fabric has a very subtle canvas texture that wasn’t what I originally intended—I wanted a silken look for the banners—but the color saturation and printing quality was so good that I went with EPI’s recommendation. If you want to try the material remember that individual results will vary based on your printer and the equipment they use. I was also able to design a few of the related print graphics: the catalogue, a postcard, and the invitation to the opening reception. The exhibit’s been well-received overall and I’m happy with how everything turned out—and proud! More photos of the exhibit and print graphics are on my portfolio, here and here. And if you’re in DC between now and January 4, 2015 (when it closes), please check it out! Great job making the exhibit “fit” the architecture of the building. Consideration for the surroundings sure makes a big difference in the final overall impression.